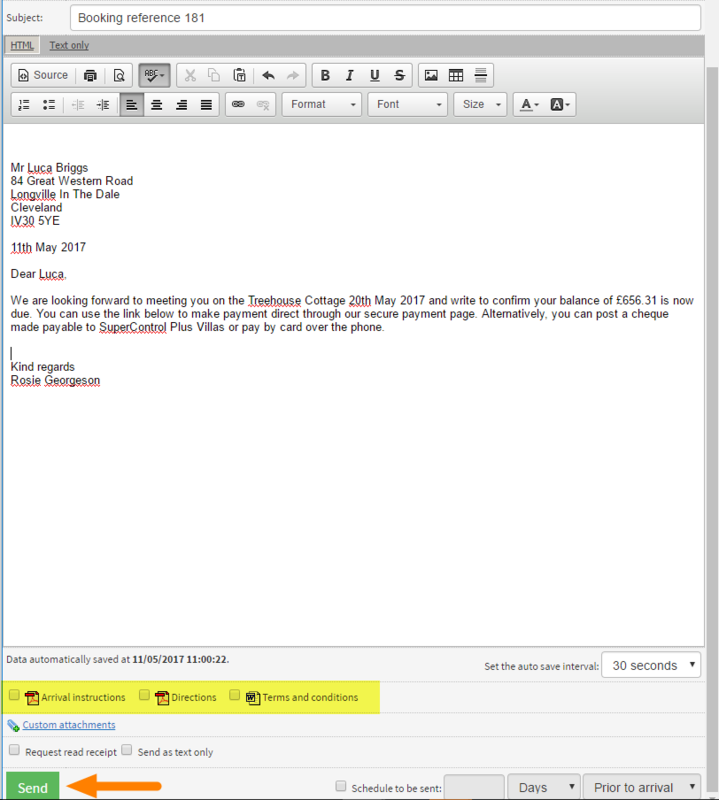 Help CentreUsing SuperControl Managing guests, emails and auto correspondenceCan I set-up attachments to be sent with my emails? Yes. You can upload attachments that are generic for all properties eg. Terms and conditions, or you can upload attachments that are property specific eg. Directions. How do I upload global attachments? 1. Go to Emails/Letters > Global documents. 2. Enter a document name and click Choose File to upload a file from your computer. 3. Tick whether you wish to attach this to your online booking summary (this is the summary the guest receives when they first place their online booking). How do I upload property specific attachments? 1. Go to Properties > Edit > select property > Documents > Go. 2. Enter a property name eg. Arrival instructions or Directions. 3. Choose whether it should be available to send to customers and/or avilable to view within the customer login by selecting "Yes" or "No". 4. If you already have a document that you wish to upload, select type "Upload file". If you wish to create a PDF from within SuperControl select "Generate PDF", this will open up a text box underneath allowing you to enter your text. 5. If uploading a file from your computer click "Choose File" and locate on your computer then click Open. 6. Tags for auto form letters: If you use our automated emails, you can add a tag for a document so that SuperControl knows to include property specific documents for relevant bookings. For example, if you add a tag called "Directions", you can allocate that to your Directions uploaded file. Repeat this process for your other properties. This means when you create an automated email you can select the tag so that the document will attach automatically and know what property to assign it to based on the booking. 7. Tick whether this document should be attached to the online booking summary when this property is booked and Save. Please note if you create a PDF using the Generate PDF function, if you need to edit the text in future you are unable to as you cannot edit a PDF. In this case you would need to copy the text and create a new document, make the changes and Save. Then you can delete the previous version. How do I manually attach a file to an email? 1. Go to the guests booking and click History and Correspondence. 2. Select your letter, select "Email" as your method of sending and click Generate. 3. Tick to include your attachments then click Send. Custom attachments - Above the Send button there is a button called "Custom attachments", you can click this to include a one-off attachment from your computer that you don't normally send. Prev: How do I add/edit an email template? Next: How do I add tags to auto populate information in my letter?